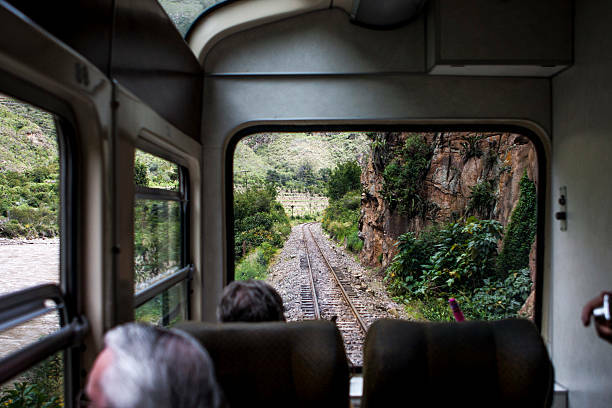 There are two train companies that operate the train journey between Poroy, Urubamba, Ollantaytambo and Machu Picchu; Peru Rail and Inca Rail. Peru Rail is the longer standing company which also is partially operating the train tracks but due to monopoly had to open the market allowing for the new company Inca Rail to enter in 2010. Both companies offer three types of trains (economy, superior or deluxe) and for all trains from the same company the same luggage restrictions apply. PeruRail The Perurail trains; Expedition, Vistadome and Hiram Bingham apply the following restrictions; “a bag or backpack with a maximum weight limit of 5.0 kg/11 lb and measuring no more than 157 cm (height + length + width). Any luggage that does not meet these limits cannot be carried aboard the train.” Inca Rail The Incarail trains; Voyager, 360º and First Class Train apply the following restrictions; “each travel ticket entitles its bearer to board the train with only one piece of hand luggage (backpack, handbag, or briefcase) weighing no more than 08 kg/11lb and with dimensions of no more 62 linear inches/157 linear cm (height + length + width).” This being said, it is worth mentioning that for both companies the luggage restrictions are not thoroughly checked and some flexibility is applied as long as the luggage is not excessively large. A good rule of thumb is the amount / size of hand luggage you would take with you on a flight. As Machu Picchu is a pedestrian town and not all hotels provide bellboys you also may want to take this into consideration and avoid having to drag your luggage all over Aguas Calientes. Any luggage you would not take with you, your hotel in Cusco or the Sacred Valley will store for you (most hotels do not charge for this). In case you would need to take your whole or extra luggage with you it is best to advise your agent or communicate this to the train company. *If you would be traveling with the Belmond Andean Explorer to Puno or Arequipa or with the Peru Rail Titicaca Train to Puno other luggage limitations apply; permitted luggage in cabins should not exceed 05 kg / 11 lbs per passenger. In case of larger luggage, the train has a luggage storage wagon. It is recommend you to carry everything you consider necessary for your trip, because access to the luggage storage wagon will be limited throughout the trip.